In a two-part interview, Kira sat down with Emma Lee from Kiwisual to talk about their Artist-in-Residence Project in Guangzhou. A year later, summer intern Josue caught up with Emma again to hear more about her experience with East x South East Asia Residency Knowledge Exchange. China Residencies: First question - who is Kiwi Chen? Emma Lee: He’s the boss. He’s a designer originally from Hong Kong and loves photography. 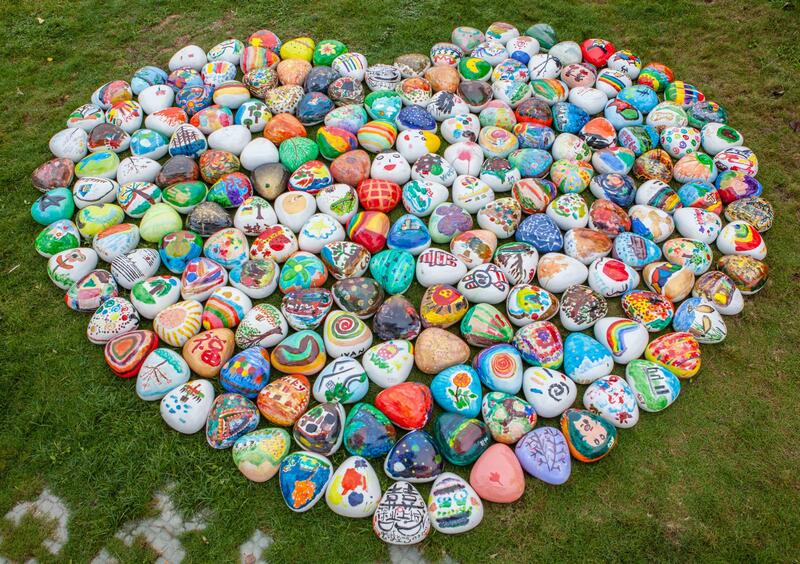 During a trip through Sichuan and Yunnan, he was inspired to commission a series of oval, cube and triangular-shaped "artist stones.“ He then looked for a place to put the stones and house his different hobbies. After two years of looking, he finally found it in the suburbs of Guangzhou. There are cabins, RVs and container houses for the artists. We only started the residency project last year when Kiwi’s good friend Steven, our artistic director, thought to invite artists from all over the world. In the beginning, we only invited artist we knew. This year, I got to know other residencies like Da Wang through China Residencies, and we started our open call. CR: Great. And what’s your background? EL: I’m originally from Foshan, around 30 minutes away from Guangzhou. My first job out of college was related to the arts. Then I went to work in media before coming back, partly because of Steven. He also paints, and he introduced me to Kiwi, who I’m thankful for since I really love what I’m doing now. My formal title now is manager of international relations department, because I mainly deal with artists from abroad and with possible partners for exhibitions of the artist stones. CR: That’s really great. Do you also host artists from China and Hong Kong? EL: Yes, and this week we have an exhibition in Hong Kong, featuring a collaboration with Hong Kong artist Justin Y. He paints with his fingers. CR: Tell me more about the stones project. 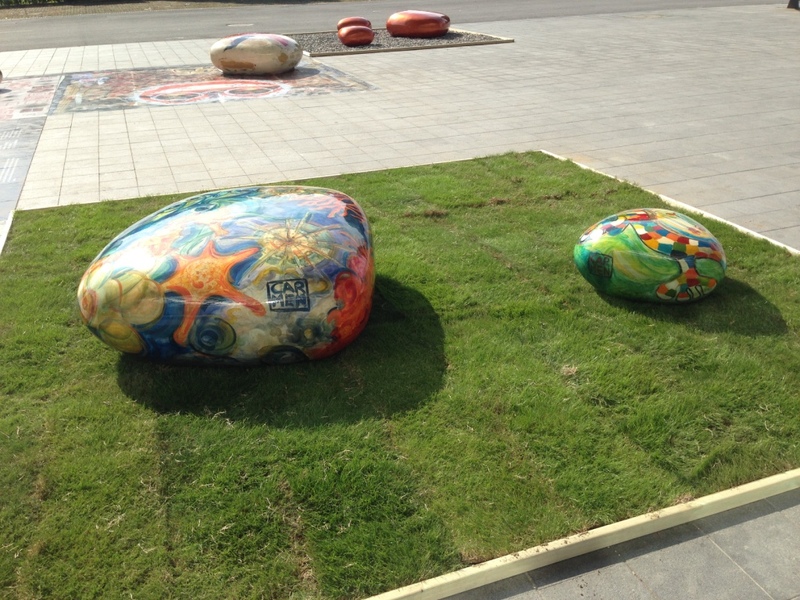 EL: Every artist that comes needs to paint two fiberglass stones, one big and one small. CR: Are the stones for sale? EL: Yes. Our main goal is always to look for places in the city centre to show them. We want to make each artist feel welcomed and fulfilled through this collaboration. CR: What else happens at Kiwisual Arteco? EL: Kiwi always tells us his main focus is art. We keep the gates closed. It’s not open to the public, we keep it peaceful. We mainly invite artists, our friends, our clients and our guests to have a good time here. We have parties and events, but it’s not easy to run this space. From time to time we rent the facilities out for yoga camps, weddings, banquets. CR: Who lives here full time? EL: I live and work here. I’m also here to host for artists. CR: Tell me a little bit about the environment and the setting around Kiwisual. EL: It’s around 50mi with two fish ponds in the middle of the estate. The ponds are surrounded by log cabins, two RVs and shipping container houses for the artists. At most, the facilities can host 30 people. Every room is a standard double room. There’s also a vegetable farm where we grow our own vegetables, and we have an animal farm. We have emus and peacocks, goats, chickens, ducks, and geese in the back of the resort. There’s also a kitchen onsite if the artists want to cook. CR: Is there studio space, or do the artists work outside? EL: They prefer to work outside so they can see what the stones will look like in the sunshine. CR: You’ve already had many artists come through. How long does each artist stay on average? EL: About two to three weeks. It depends on how each artist works. One artist took three weeks to finish one stone because her work was so detailed. At first, all the artists came from nearby, from Hong Kong or elsewhere in China, even if they were not originally from here. We worked with Frog King, for example. He’s great, and he was Steven’s teacher. CR: I like that you’re also very transparent about how much of the sales proceeds go to the artists and so on. How would you like the residency to develop? What are you hoping for in the next few years? EL: I was given a goal of creating 100 stone works in total. We’re at about 40 right now [April 2016], so we will keep inviting artists. We also are in conversation with different consulates about supporting air tickets. So far, the French have been the most responsive, but we will keep inviting all kinds of artists. CR: And do you ever work through open calls, or is it always through invitations or recommendations? EL: Right now we work with our resources and the network that we have. Kiwi is also a government official, a member of the Hong Kong section of the Guangzhou political committee, so he knows a lot of corporate executives that end up contributing. For example, he introduces people to us, invites them to come, to visit the area and see the stones. It gets the word out, and they recommend possible artists to us. The exhibitions and workshops are also a good way to promote our residency. We also take recommendations from other residencies like Da Wang. CR: Can you talk about your experience at the East x South East Asia Residency Knowledge Exchange ? EL: The Res Exchange was a one-of-a-kind experience where I witnessed Beijing's art scene. During the one-week visit, Jen from Red Gate (the host) took us to the most renowned galleries and art centers of the city. We got to know artists, curators, gallery owners and fellow residency directors that we would have never met otherwise. The most touching thing about the art people in Beijing - including our host - is that they didn't grudge at all sharing their own resources with us! CR: What are some of the challenges of running a residency like the one at Kiwisual? How did your participation on East x South East Asia Residency Knowledge Exchange help in addressing those challenges? EL: The biggest challenge of running anything about art in China is money - you got to have some sort of business of your own to cover the "luxury" of doing art, because art has always been off-mainstream in the country. Especially in Guangzhou, with a reputation of being under the baton of money and business, it is hard enough just to maintain the day-to-day operations of the space. The Res Exchange is of great help in tackling such challenge because it puts me in contact with more professional artists/curators/gallery owners/residency directors to work with in the future. New projects mean greater chances of attracting possible sponsors and target clients. CR: Have you done any changes on the Kiwisual residency based on your participation in the exchange? EL: Another thing that blew my mind in Beijing is that all residency projects have top-notch facilities! Professional studios - even with splendid stereo systems (Red Gate residency). Directors like Jen from Red Gate was so considerate to artists and us: She saw to most people’s needs as they were adjusting to a city like Beijing. Witnessing the good work of Red Gate, I looked at our own project and realized there is so much to be desired: professional studios (we don't have a proper studio space so far) and a caring director who sees to the needs of the artists. I haven't got a chance to make the changes since I am now running the gallery in Wuxi City which is our main focus at the moment. I will make that happen when we invite artists over in the near future. CR: Who participated in the Res Exchange and who did you interact with? EL: Mostly fellow residency directors: Jen from Red Gate, Anna from Singapore, Jessin from Malaysia and Lulu from Beijing. I also had a great time getting to know artists from the Red Gate residency and people from other residency projects and galleries. CR: What kind of things did you learn about yourself and about your own residency through the Res Exchange? EL: It is so important to be bi-bilingual/international to do art in China. Languages open the doors of new worlds for you! Keep your mind open, meet with other professional art people from all over the world and learn from them humbly. That way you will stand more confidently in the industry. CR: Did participating in the exchange help you understand the art world or China in a different way than you had before? EL: It certainly did. I met the most open-minded people in Beijing. The Res Exchange provided us an opportunity to see and learn about what fellow art people are doing in another city, in other countries. That experience is life-changing! CR: What was it like to have this exchange take place in Beijing? EL: "Mind-blowing" is the word to describe my experience in Beijing. It was magical. This interview was conducted over email in July 2017 by Josue Chavez & Kira Simon-Kennedy for China Residencies.